Dave Chappelle is apparently a big Radiohead fan, always ready to hit karaoke bars, birthday fetes, and Saturday Night Live afterparties with his rendition of “Creep.” And should he ever want some back-up vocals, he could probably pluck just about anyone out of the audience, restaurant, etc. 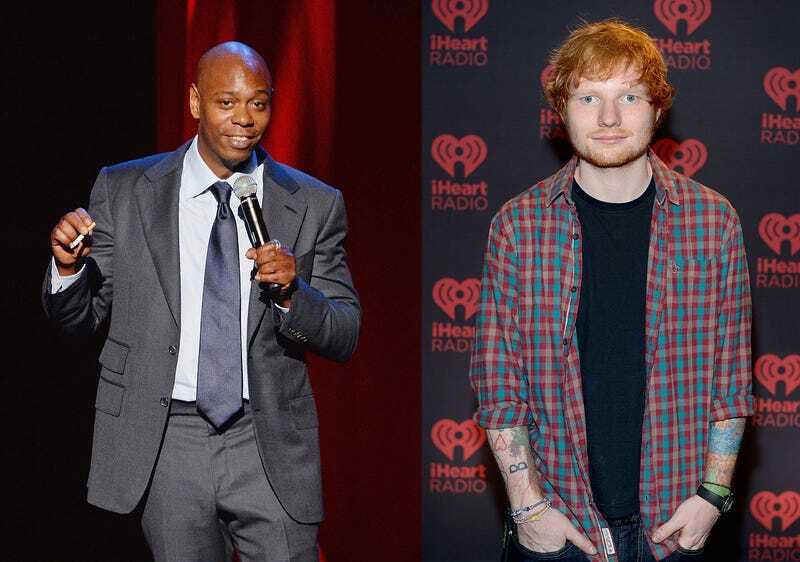 But it turns out his duet partner of choice is Ed Sheeran, at least according to this NME post which notes that Chappelle has teamed up with the “Shape Of You” singer for “Creep” on more than one occasion. There was the time the two sang about wishing they were special while in Bethesda, Maryland (and really, who hasn’t). Then last week, French musician Frédéric Yonnet invited Chappelle to an event he was hosting at the Eighteenth Street Lounge in Washington, D.C. There Chappelle was joined by Sheeran on guitar and Yonnet on vocals for “Creep” before going into Stevie Wonder’s “Superstition” and Bill Withers’ “Ain’t No Sunshine.” The performances were recorded by fans and posted online before being pulled, but someone did manage to save this for posterity via Instagram.